In 1979 my parents decided to build a house. They like to call this era the “Mother Earth” phase of their lives. I just call it my childhood. 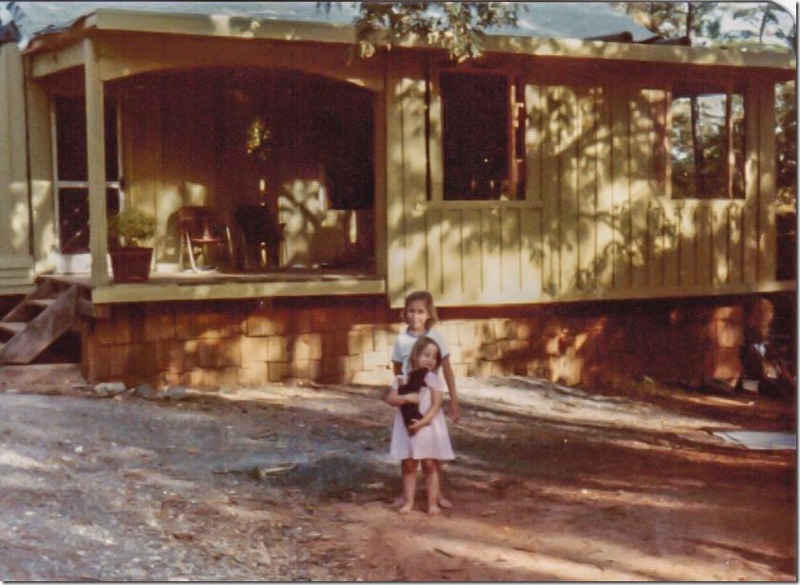 My earliest memories begin in this home that they built for us nestled underneath the tall loblolly pine trees in West Blocton, Alabama. Actually most of my memories take place outside of the house, since that is where I spent the majority of my time running around barefoot in the dirt with my older sister and neighboring kids. I was less than two years old when they started construction and close to five when they finished most of the work. We moved a few miles up the road to a new place when I was seven, so our time in the house was relatively short, in the grand scheme of my life. But still I consider to be the first house I “grew up in” since it is the first house I remember vividly. In the late 1970’s my dad was an avid fan of The Mother Earth News, which was basically the precurser to Doomsday Preppers. With headlines like A Beautiful Earth Sheltered House…In Eight Hours! or Foraging For and Enjoying Wild Foods or Grow a First Aid Kit this monthly publication filled my dad with a sense of urgency to find a piece of rural land and build a house with his own two hands before the final apocalypse took us all away. 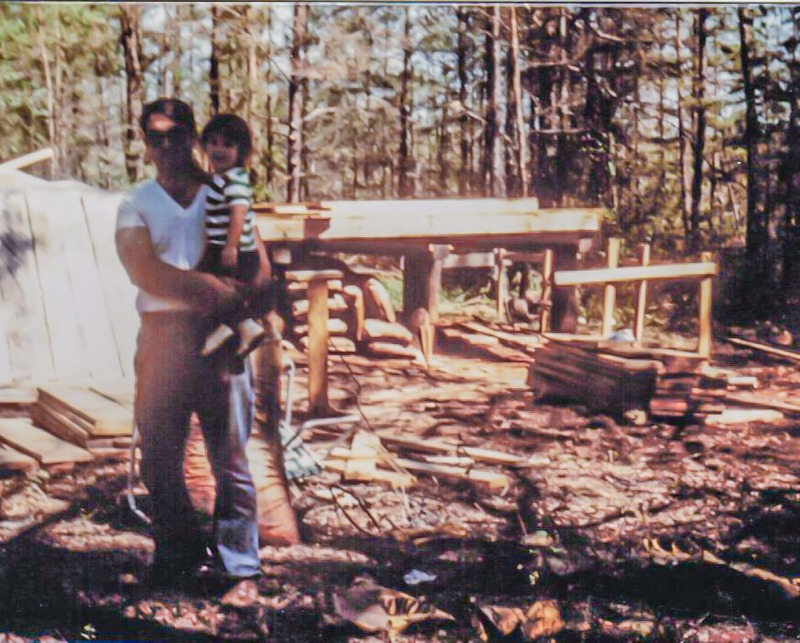 Anyone who knows the 2013 version of my father would think this is crazy talk because he is a completely different person now, but back then he had a pioneering spirit that prodded him to build this house for his wife and two little girls in the Big Woods. How very Charles Ingalls of him. Because they wanted to save money (and they were doing it all without a construction crew) the early phases of the construction were built section by section in a rented warehouse 30 miles away in town. 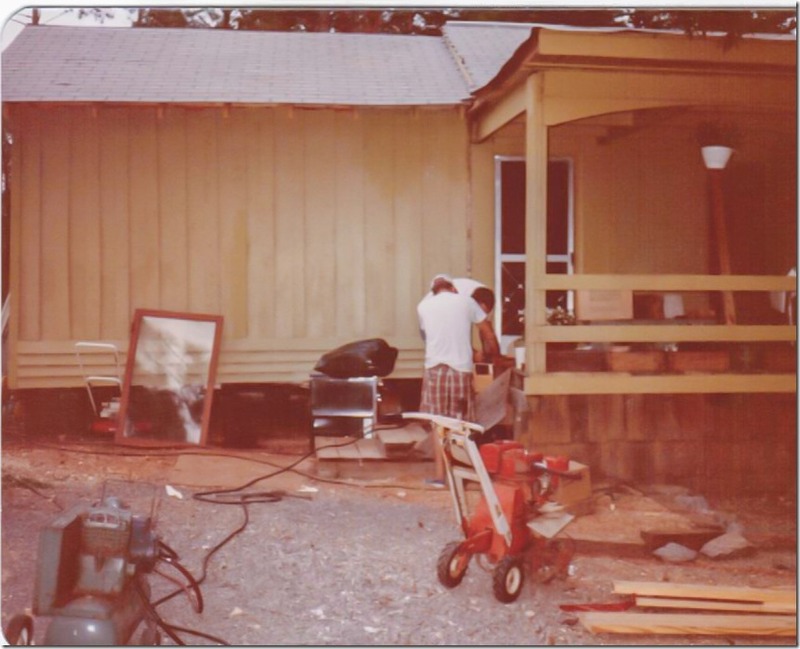 While this house was being built we spent a very cold winter living in my grandparents cabin on the Warrior River just upriver from the Gorgas Steam Plant. The river cabin was meant to be a summer place, so heaters were not in abundance. My dad worked full time and my mom stayed home with us. In their spare time they would go to a warehouse in Bessemer and fabricate parts of the new house a little at a time. It was the birth of my family’s career in the modular construction industry. The foundation of the house was made from lengths of reclaimed creosote telephone poles that were bolted to salvaged railroad ties. 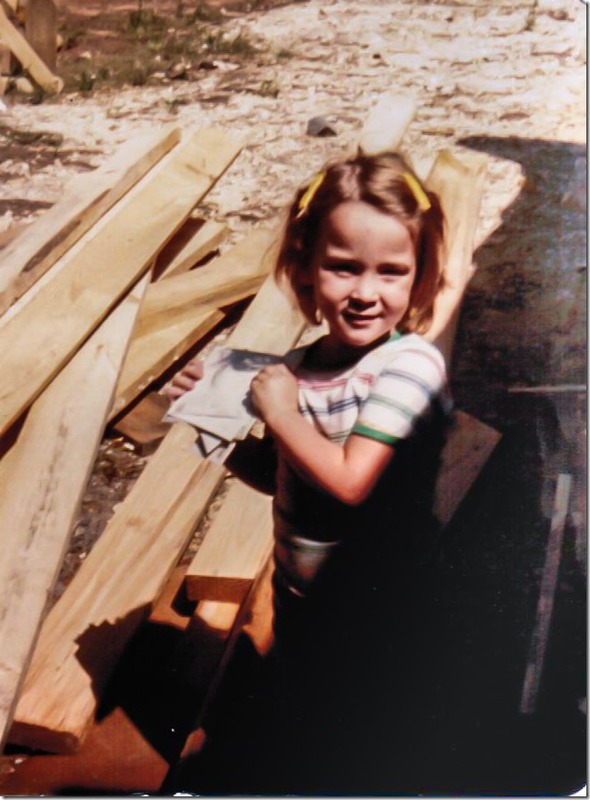 Apparently I come from a long line of reclaimed wood addicts. They dug the foundation holes by hand with post hole diggers to sink the telephone poles in the ground. The poles were so old the creosote had settled to the bottom of each one so they buried those ends in the ground and figured that the foundation would be preserved for life. My dad cut the telephone poles and railroad ties with his Stihl chain saw. It was his prized possession because we literally needed it to live. They cut trees with it to clear the land before they began building. Then they took those trees and cut them into firewood over the next few years. My mother said she had never seen a man sharpen his chain saw blade before, but he had to do it regularly to keep it in perfect working condition. He wouldn’t even loan it out to the neighbors because it was his prized possession. 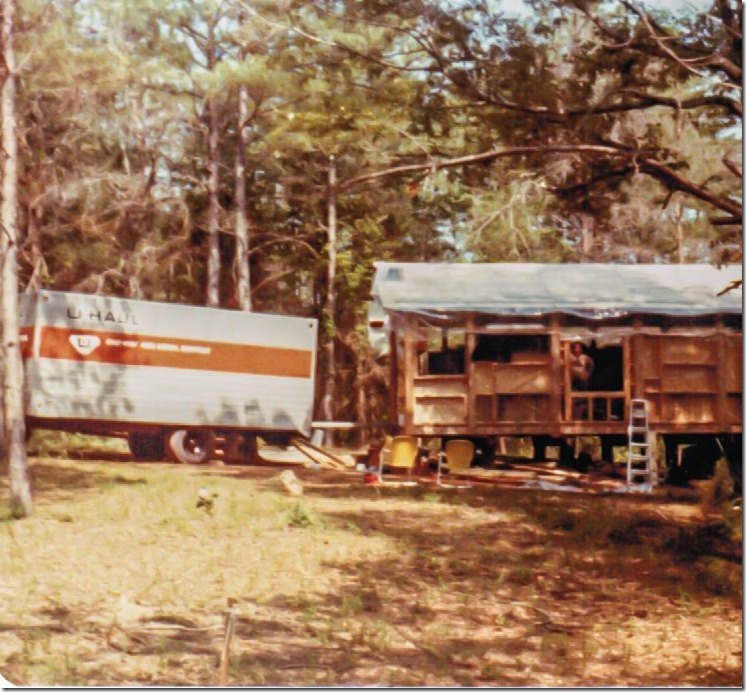 When all of the house components were ready, my parents loaded the roof trusses and wall panels into a U-Haul truck for the big move in June of 1979. I’m not sure how long they kept that U-Haul rented, but the owner was a friend of my dad’s so he must have cut him a good deal. The outside footprint of the entire house measured just 14’ x 28’, which is about the size of my current living room. They raised the walls a section at a time by lifting each heavy piece with a wall jack then nailing the wall sections to the uprights. The walls were finished on the outside with foam board insulation and inside with wallpapered sheetrock. More loose insulation was poured in the middle and covered with heavy gauge plastic to keep moisture out. 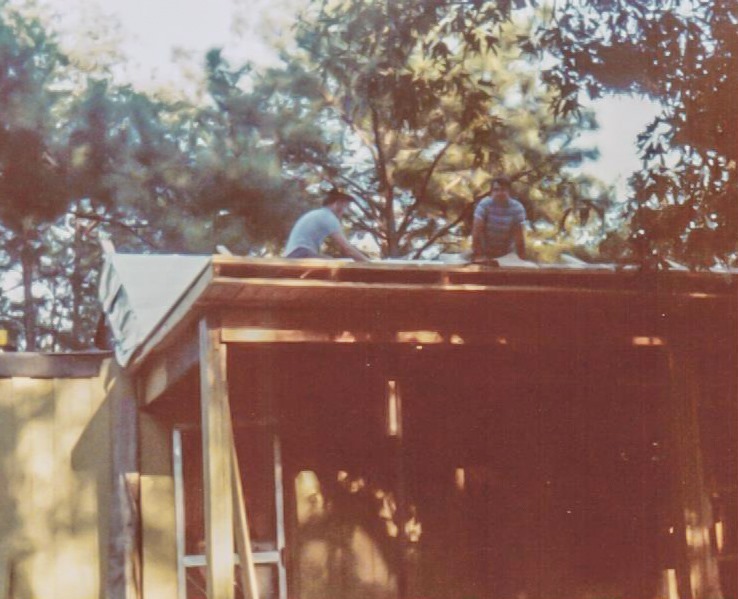 The plywood roof was also covered in plastic because shingles took a long time to install so they saved that part for later. They figured we could live without a roof since it was early summertime in Alabama and there wasn’t any chance of us freezing to death. The plastic didn’t keep the rain out for long, though, so they laid roll roofing on top of the plastic to keep us a little bit drier. The porch came next, so we wouldn’t have to climb a ladder to get in the front door. The back door location was up in the air for the better part of the summer since my dad decided to put the bathroom right where the original back door was framed out. For a few months whenever someone visited us they had to step into the bathtub to get into the house (that is, unless they wanted to climb a ladder and go in the front door.) Guests were not that common, but they did have to help a visiting preacher climb in and out of the tub once. 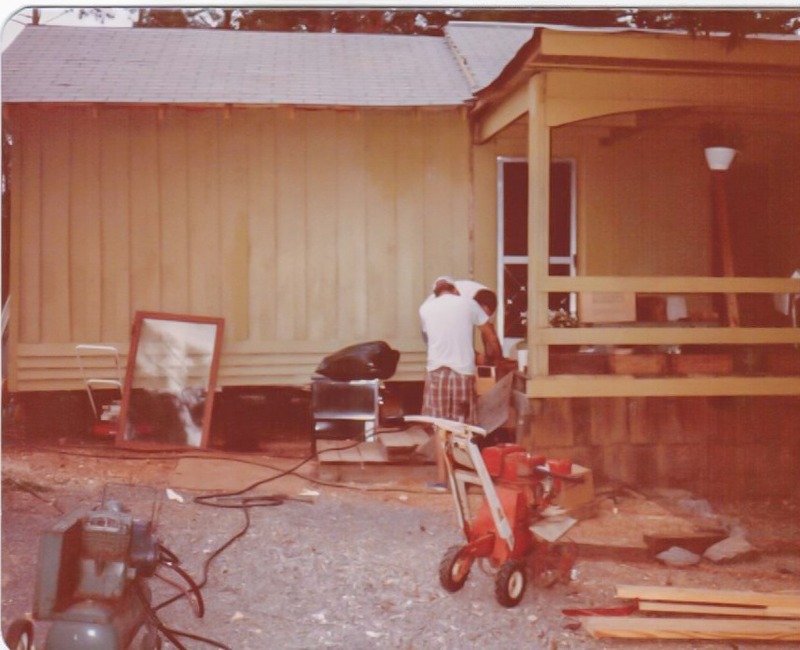 The tub wasn’t actually hooked up to any plumbing until they dug their own septic tank, which was just a 50 gallon drum that they poked holes in and buried in the backyard. We bathed outside under the hose pipe for the first few months of living in the house. This next part is not for the faint of heart, but we literally went to the bathroom on newspapers then buried it with a shovel around the backyard in latrines all summer. And you think potty training your two year old is hard. Imagine paper training them first, then potty training later!? Getting a flushing toilet and draining bathtub was reason for celebration that Fall! We laugh about it now, but there are times we wonder why the neighbors didn’t call DHR and have a social worker visit us. Thankfully that never happened, because aside from being very poor, we were otherwise well clothed, well fed, content and totally happy kids. I do not have a single bad memory from my childhood. Every one of my memories fill me with happiness because it was such an adventure to live like that as a small child with a huge imagination. We didn’t have television for a while, and when we finally got one it was a black and white tv with rabbit ears that barely got any reception except for PBS on a clear day. Without any electronic entertainment we were forced to use our imaginations and make up games outside. 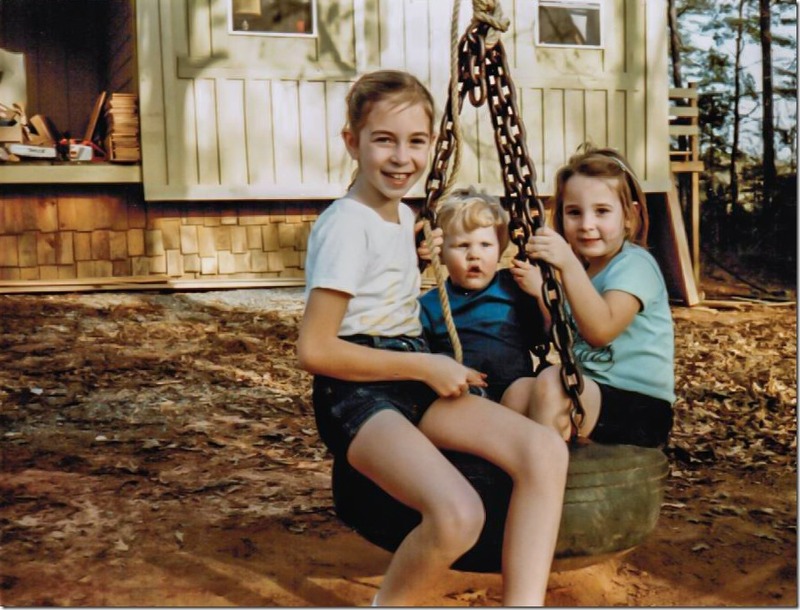 My Papa hung an old tire swing from the big oak tree in the front yard, where we spent hours swinging around and around. There is no greater entertainment for country kids than a tire swing in the front yard. My mom didn’t have a laundry room, but instead our avocado green washing machine sat outside on a small concrete pad in the backyard that they had mixed and poured from a wheelbarrow – one pour at a time. Since the washing machine sat outside my mom had to keep it unplugged when she wasn’t using it so we wouldn’t get electrocuted when it rained. 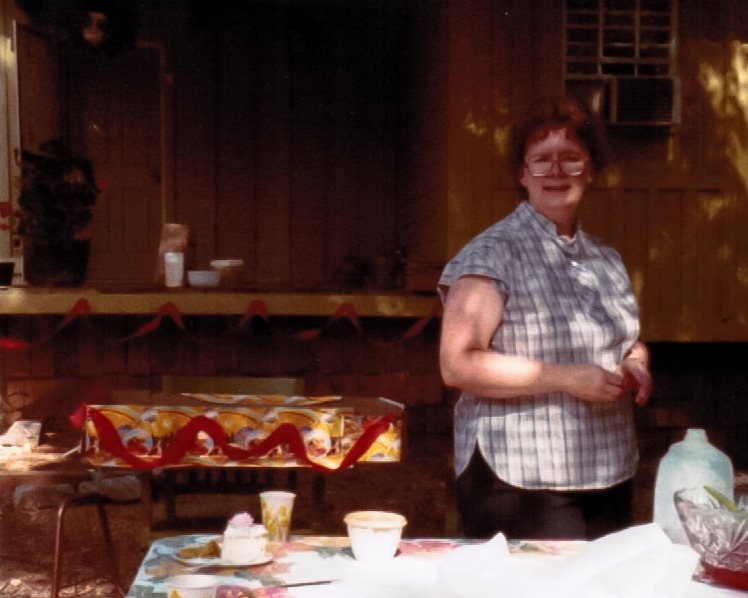 I can remember her hanging the laundry on a clothesline strung up between two pine trees to dry our clothes, while eating popcorn from a tupperware bowl and talking to my aunt Kathy on the phone (what kind of freaky long cord that must have been– this was way before the days of cordless phones or cellphones!) One day while she was hanging clothes and talking on the phone my dad and I discovered the empty husk of a locust that had recently molted and shed it’s skin on a tree. He tried to prank my mom by getting me to take the locust shell over and slip it into her popcorn and see if she would eat it. I don’t remember her reaction, only my dad’s mischievous grin and laughter when I actually carried it over to her and put it in her popcorn. That is SO something Garrett would find hilarious these days. My parents tried and failed at building a rock chimney for our wood stove that sat in the living room, so instead they settled for a stove pipe that stuck straight through the outside wall. When all the firewood was used up we went to a local sawmill and bought their cheap end cuts to burn in the stove. That wood burning stove would come in handy during the big ice storm that hit our region in the early 80’s. The ice was so thick on the pine trees that they sounded like gunshots firing all around the house when they would snap under the weight of the ice. We spent a few days huddled up together in the living room without any electricity. We were thankful to have the wood stove to keep us warm. For entertainment my mother tied a flashlight from a string on the ceiling so she could have light to see to work her new Rubix cube. Because even Pioneer people of the 80’s needed some pop culture. For a time we only had one window on the front of the house. When the western sun hit it just right you could read the words “ice cream” on the glass because it was a salvaged store front window that they had cleaned as best they could. For a while our front door was a sheet of plywood hinged and fastened with a clasp and padlock when we left home. Not that a padlock was necessary since we didn’t have much to steal. 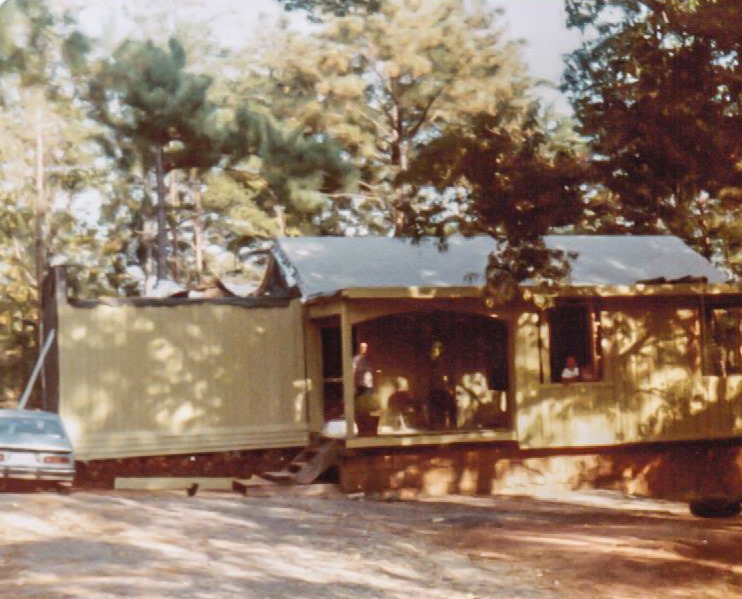 Inside this tiny ramshackle house was a beautifully stained and varnished A-frame ceiling of 2×12″ boards that my parents lifted over their heads on a ladder and nailed to the very high ceiling joists. 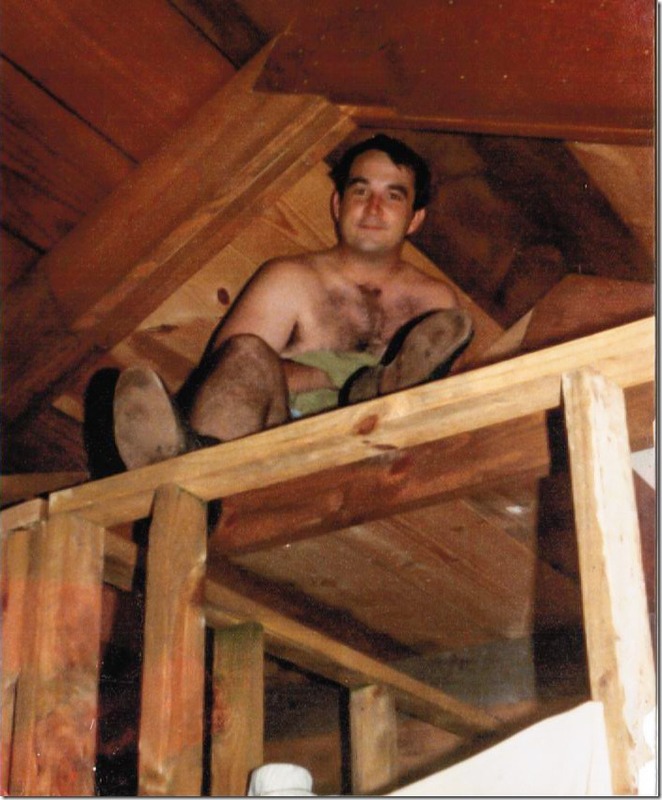 They also built a sleeping loft for us way up high in the rafters with a ladder in the living room. At just two years old I toddled my way up the ladder and got my head stuck between the rungs, so my dad ripped out the ladder not long after that. That was the end of our Little House on the Prairie sleeping loft. In the beginning there was no kitchen or bathroom but everything was paid for, including the land, so the allure of owing no mortgage won out over any kind of modern day conveniences. They built onto the house as they could afford supplies so it went slowly. My mom cooked on a hot plate and in a microwave on our plywood countertop. They worked on the house every day after my dad got home from work. At night while watching TV on our old rabbit eared black and white TV set, we sometimes filled the cracks between the walls with torn newspaper strips, stuffing them in with a butter knife. After about a year of living in one room together, they finally took down the bedsheets that were nailed to the studs for privacy and added on a small addition to the house with real walls made with plywood and sheetrock. This became my parents bedroom, but still we all slept together in the same room. I slept between my parents in their King size bed, and my older sister slept on top of the dresser with a blanket and a pillow for a bed since there was no open floor space in the bedroom. 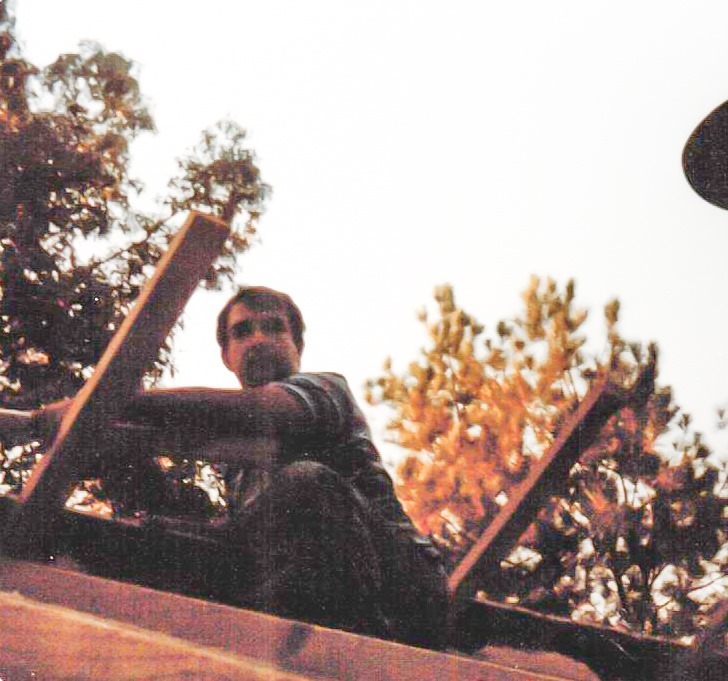 Thankfully they were old pros at building roofs by this point, so the roof was added quickly to this addition along with the help of my Uncles Jack and Warren. The year before we sold the house my parents added on a small 8×12 bedroom that my sister and I shared. My dad built platform beds in an “L” shape in one corner of the room, with storage underneath and a little set of steps so we could climb up in our beds every night. I can remember lying in bed at night looking out the window at the trees swaying and being so frightened, even though I was in the same room with my sister and literally steps away from my parent’s bedroom. Whenever Garrett gets scared at night I remember how hard it is being a little kid in the dark, and I cut him some slack. We had a few neighborhood kids to play with, including two little girls named Amy and Alicia who lived right across the street (or dirt road, I should say). We would make mud pies and roll up elephant ears to make mud burritos. We straddled the big silver propane gas tank and pretended to be cowgirls riding horses across the Wild West. We rolled down the windows of my mom’s little blue Chevette hatchback and pretended to be the Dukes of Hazzard by climbing in and out of the open car windows. We drew on cardboard boxes and pretended that we were the Boxcar Kids. Amy and Alicia’s dad owned a dump truck company, so whenever a big truck parked in their driveway we would take chalk and write on the spare tire that spins freely in the middle of the truck. My sister would grab a stick and pretend to be Bob Barker while we all took turns “Spinning the Wheel” while pretending to win the Showcase Showdown on The Price is Right. My great aunt Ruby had once been a contestant on The Price is Right, so we thought it was the greatest game show ever. We all had tricycles and bicycles and Big Wheels, so we roamed the neighborhood in a pack together, never in any fear of not being close to our mothers. Free range parenting was the rule back then, and we took full advantage of it. My childhood was spent picking honeysuckle off the vine for hours and sucking the tiny drops of sticky sweetness out of the center of the flowers. The ditches around our house were filled with wild pink roses and blackberry vines. If we could avoid the thorns, snakes and bumble bees, we filled tupperware bowls full of blackberries and came home with purple hands and faces. Yes, I had an excellent childhood. Even though we were poor, my mother always made an extra effort to make our birthdays a special event. Her grocery budget was only about $25 a month, (maybe less some months) but she stretched it by clipping coupons and cooking all of our food from scratch. We lived so far from town that eating out was not even an option anyway. For birthdays, she baked our cakes and decorated them herself. Long before Pinterest came along she was cutting out ideas from magazines and making us special treats like these upside down ice cream cone clowns that melted in my hand as I held it out for this picture. Since my sister was born on the Fourth of July, my parents threw a huge mid-Summer birthday party for her classmates to come over and celebrate. Crepe paper streamers and crystal punch bowls look out of place in this picture, but at the time it was the best we could afford. 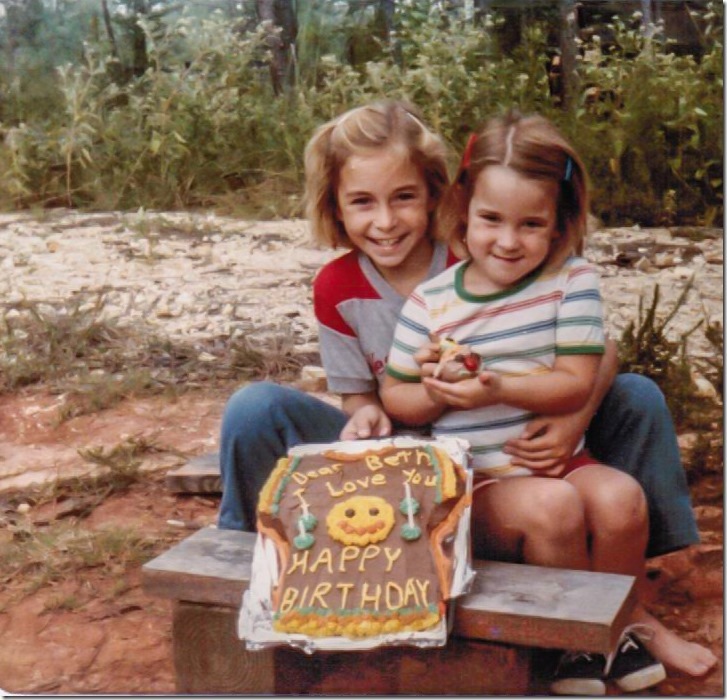 My mother always, always, ALWAYS made our birthdays a special event, no matter how much money was in our bank account. I love that so much about her. Both of my parents are creative and know how to throw a great party, and that tradition has not changed whether we are rich or poor. I am so thankful for this upbringing. I would not trade my childhood for anything in the whole world. It was an excellent adventure and a valuable lesson in hard work, humility, and thankfulness. I have never been materialistic with clothing, shoes or purses, mainly because I remember a time when my mother barely had enough money to buy me a pair of shoes at the local Ben Franklin dollar store and all of my clothes were 3rd generation hand-me-downs. I try not to be judgmental of anyone’s choices or lifestyles because I have never walked in their shoes, nor they in mine. I grew up poor, but I grew up unashamed. I am so privileged to have been given this story as my childhood memories. I feel so badly whenever I meet someone who reads my blog now and they say that they are “ashamed” to let me come over to their house because it’s not decorated perfectly or a room is unfinished or the front porch railing is a little shaky. I want to tell them “Hey! 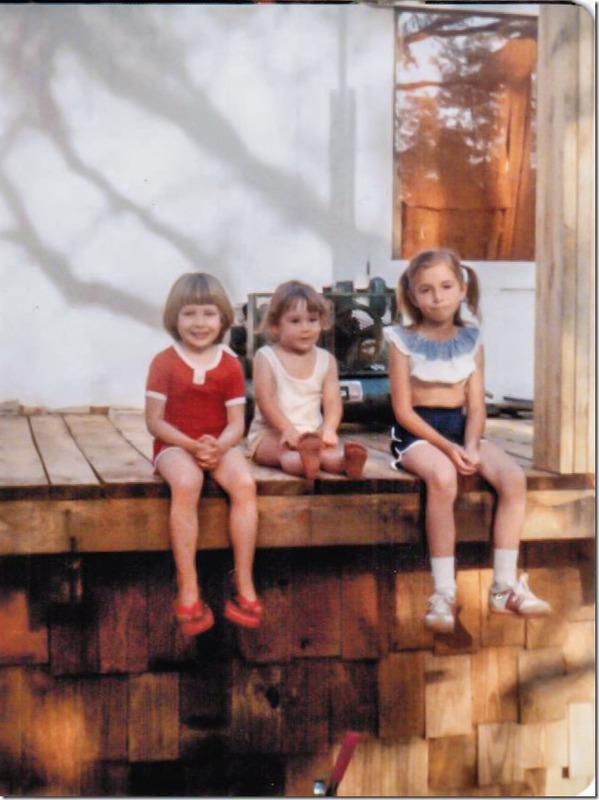 At least you have a porch railing and you don’t have to climb through a bathtub to get inside your house!” That is the reason I wanted to write this series about the houses of my childhood– to show people where I came from. My true roots are not in a big fancy brick house with the perfect fireplace mantel decor. I blog about that stuff because it is my passion now. I love being an inspiration for others who need ideas on how to arrange their living rooms or decorate for Christmas. I do it because it fills me with joy to be creative and share those ideas with others. I have never been a fan of buying stuff just for the label. If that was the case I surely would not be a DIY blogger! I’ve always been frugal and tried to figure out ways to save money on a project, so this blog is a natural projection of that desire to show others how to save money on projects, too. If you meet me one day and you feel like you don’t want me to come over to your house for fear of what I might think of it, I can promise you that I will send you directly to this blog post as a reference. Please know that my roots began as humbly as a person’s can- in a tiny house in the woods of Alabama, where love was abundant even when money was not. And I’m so very blessed because of that. Great story of your upbringing! I grew up in southern Missouri and lived some years in a mobile home my parents pulled in front of this huge stone house they hoped to renovate. It crumbled as they progressed and I thought we were doomed in this trailer out front forever! We got out of it into a modular home they eventually put where the stone house was. I thought we were moving into a mansion! Many later years I had a house built for my son and I (me being a single parent by then). I was determined to stay on a budget so I built a little 800 sq ft house with two small bedrooms. It felt like a mansion again because it was all mine! That house was totally paid off five years ago and we still live in it. It is tiny but all ours and paid for so I feel like we are rich! The deck we built on later (our back door also went no where!) is as big as the house! We love it there! Thanks for sharing the humbleness of life! Love this story, Diana! Thanks for sharing! Such a touching post, Beth! Thanks so much for sharing it with us. I enjoyed taking a look at what your childhood was like – it does sound like quite an adventure! Cute pics too. Thanks so much Erin! I saw the smiling pics of your little boy heading into school this morning. I hope you’ve recovered! I’m in this same boat next Monday. We need to hold each other. Beth, this was fascinating to read. You really have to admire your parents for their adventuresome spirit back in the day when everyone else was piling on the debt! And you look so much like your dad when he was young. I think you were blessed to grow up this way as it helped to develop your creativity. And as far as your writing skills, I think they are superb! LOVE it, Beth! That was before my time but I remember all the pictures! I love that you are so proud of how far y’all have come yet are so proud of where you started. Love you! 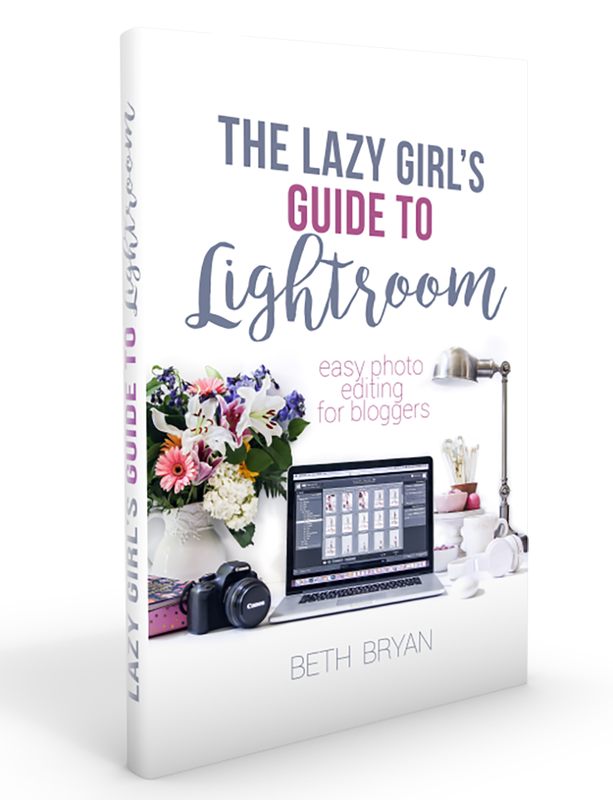 Beth, I loved reading your story! Mine is VERY similar, except it took place in Southeast, Texas and there were four of us kids! 😉 I think it took my Dad 6 years to build our house and in the mean time we lived above our barn. (One open room with a kitchen downstairs.) I think it’s one of the things that drives my passion today for DIY. Thank you so much for sharing a little piece of yourself with the rest of us. Amazing story- living above the barn. I love it! I agree- my DIY roots run deep because it’s all I’ve ever known. I’m not scared of power tools, that is for sure. ? Beth, I’m so glad you told all of this. It sounds like it was challenging and wonderful all at the same time. Just imagine all the skills you learned from your upbringing! What a gift. Your parents sound neat. My parents had a stint of great interest in Mother Earth News and they considered building a dome house…do you remember those? Oh mercy, we still have some of those around Texas and they are u.g.l.y! We didn’t end up doing it most likely because we didn’t have the money. YES! I remember the dome houses. They look like a spaceship landed in the yard. I love hearing all of these stories about Mother Earth News. I wonder if they know how many people from our generation they influenced? Beautiful story Beth! Thank you so much for sharing! Beth, I’m so glad we survived those years! 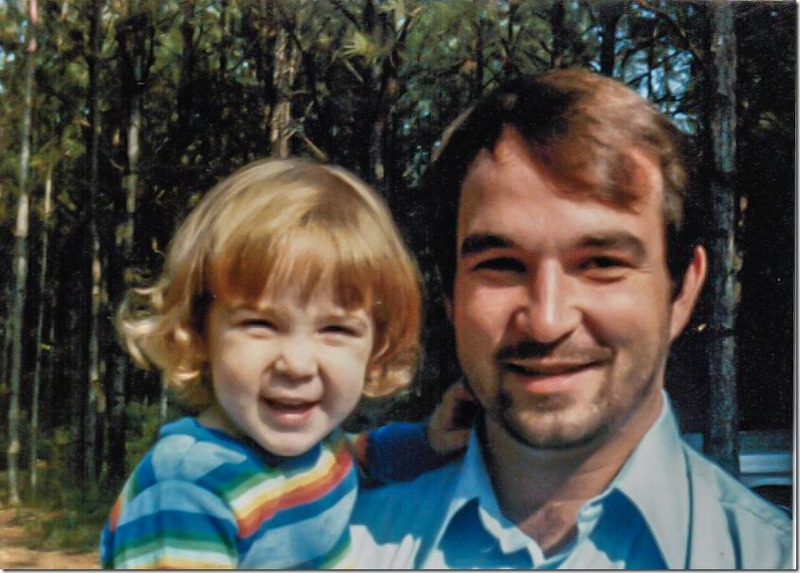 I once had a bird build a nest in your daddy’s pants pocket on the clothesline. Remember our “library” in the old broken down VW wagon? Garry bought out a bookstore going out of business for $20. Lol. We have always loved reading books and learning. Your Smurfette doll was lost at the Bham Public Library one trip downtown. Your daughter may think she grew up poor, but by the time I finished her post I concluded she was rich in all the ways that really mattered. I forgot about the time the bird made a nest in his pants! LOL The circus tent cake pictures are some of my favorites, but the train cake was the best one! I need to find pics of that to share on my birthday! Love you so much, mama! Beautiful tribute to family and humble beginnings. What wonderful role models your parents are…a testament to simple living and hard work! Haven was wonderful last week! It was great to see you and thanks for taking the time to speak with me. I am even more inspired after reading of your humble beginnings. I gained so much info last week, my head is still spinning. I am giving the blogworld an honest humble try…going at it full steam. Based on all of the info I gained last week, my next post should be “How not to start a blog!” LOL! Suzanne it was SO great seeing you at Haven! I am so happy you’re giving the blog world a go– it’s such a supportive community and I hope you make lots of great friends! I will share my posts that have pics of your furniture on your facebook page soon. Lots of good stuff, and I’ll definitely plan to swing by the store soon! Beth, I loved reading this post. What a beautiful story! Oh, and The Price is Right IS the best game show. Ever. 🙂 Thank you for sharing this story. What am amazing story and post Beth! I loved reading about your childhood – thank you for sharing it. But you outdid yourself in vividly describing it all even better and in more details than I’d ever heard it–especially the heart and soul of the experience for a young child. And you made me prouder to know your family and call them my good friends than I already was. Thanks for sharing your eloquent walk down memory lane with your many readers. And me. Thanks so much for the comment, Pam! I am honored to have you as a reader on my blog, as one who knows my past after so many years of history that we share. What a wonderful story. You were rich with love and pioneering parents who weren’t afraid to be poor in order to be free. I too grew up poor. It gives us character. Someone who has always had it all, they don’t have the reserve and resilience we do. I applaud you for writing this so honestly. PLEASE let me know when you blog that story, Virginia! I wanna be first in line to read it! What an empowering and inspirational story written so beautifully and honestly. I loved reading it. So much to take from it. I must say, I actually feel thirsty for posts of this nature (ie. honest, real, inspirational, doesn’t put an overwhelming value on money and all the persk that come with it etc).Thank you for this great post, it is one of my favourites to the day. I’m so glad you liked it! I agree- it’s refreshing to get “real” for a change. I miss posts like these as well. Time to do more of them like this!! What a beautiful post, Beth! Thanks so much for sharing your story and your heart. I, too, grew up without a lot of material things, and I can resonate with so many of your sentiments. Thank you for “putting yourself out there” like that. Hope you’re having a wonderful weekend! Beth this is beautiful. My family is from Townley, AL and the house my dad grew up in was maybe the size of my Living Room and Dining Room. My dad now lives in a mansion but he is so humble and giving to others because of where he came from. My mother had the same upbringing and there are pictures of her when she could not afford a bra and you can tell. I tell my dad all the time how much I loved the memories of visiting my grandparents on there farms where we played in the pasture and picked blackberries by the pond. I so wish my boys could experience that now. You were so lucky to have the love that you did from your parents and that was worth more than a color TV and a front door with no bathtub. You have stories to tell that made you who you are and you are appreciative and sensitive and that is few and far between these days. BTW my older son’s name is Garrett as well, such a great name! Kelley, I love your story. Thank you for sharing it! I think it’s great that you shared this part of your childhood. It reminded me of my own childhood. And you’re so right..there should be no shame in being poor. I laughed. I cried. I went through so many emotions that had not surfaced in decades. Being 61 now, makes me realize how very, very blessed I am to have you and Julie as my legacy. There are not a lot of lasting things in this life. The one true thing is character. It endures. It is with such pride I read your stories, and it makes me very happy to know you haved blossomed into one of the sweetest and most talented people on the planet. Those years were very tough. As you now know, it is a scary adventure growing up into being a young, dumb parent. There are really no books or lessons on how to rear great kids. It is a huge amount of trial, error, and lots of worry filled nights, and gripping fear. Now that we have a nice home, and a great business, it seems like it has always been the way things are right now. The trip back in time 32 years was very good for my soul. ( wish I was still anywhere near that physical condition !!). You and Julie are two of the best moms out there. My sweet grand babies are in good hands and I know they will grow up in fine homes and not have the growing up poor experiences that you both had ( endured). But you both are teaching your kids to be giving and loving and respectful of others. In the end, that is the true measure of parenting. Rich, well off, just getting by, or dirt poor has nothing to do with how we treat others in our lives. I love you more than life itself. You make me proud to be your dad. This is a wonderful piece of writing and a warm, honest tribute to your family, and to who you are. I love it. Lots of memories in that post Beth, and I think there are many of us that can see some of ourselves in them, either as kids or adults. What a great read and love the pictures. Takes me back to our early days in the church. Like you, we grew up “poor” too but as kids, we didn’t really know it. 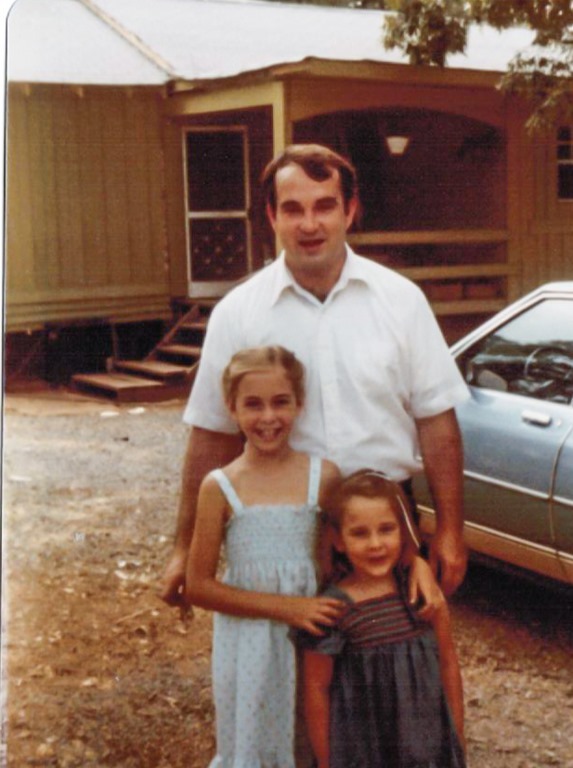 Daddy was in the service and Mom was a stay-at-home Mom who took care of all of us, even when she wasn’t feeling well. We always felt loved and that was the important thing. Like Garry, we’re in those years now where we do a lot of reflecting on our lives, and wondering if we did our best and what we might have done different. It’s obvious that your Mom and Dad should be very proud and have done well with Julie and yourself. Deb and I are so lucky to have you guys in our lives and I just wish we could see each other more often. Love you guys. 🙂 Thanks so much for commenting, Gary. I am lucky to have you in my life as well! Send my love to Debbie and your boys. Amazing Beth, I can relate to so many things! Thanks for sharing your childhood memories. I’m jealous that you have so many photos, that’s one thing I don’t have. Not only do I come from a long line of DIYers, I also come from a long line of people who like to document their DIY progress with pictures. My mother would have made an excellent blogger back in the day! LOL!! Thanks so much JB! I can remember more about things that happened 30 years ago than I can remember about last week!! 🙂 At least I’ve got my long term memory. Wow, you guys were all so adorable! What an upbringing!! Your parents were very brave. I remember my “I want to be like the pioneers” phase – sure glad that’s over!!! Never again, it’s way too much work and too hard on the body. and look where you are now. You have so many skills and talents from those early days. You are amazing!!! You had a lovely-sounding childhood…I smiled the whole time I read this. Thanks for sharing! 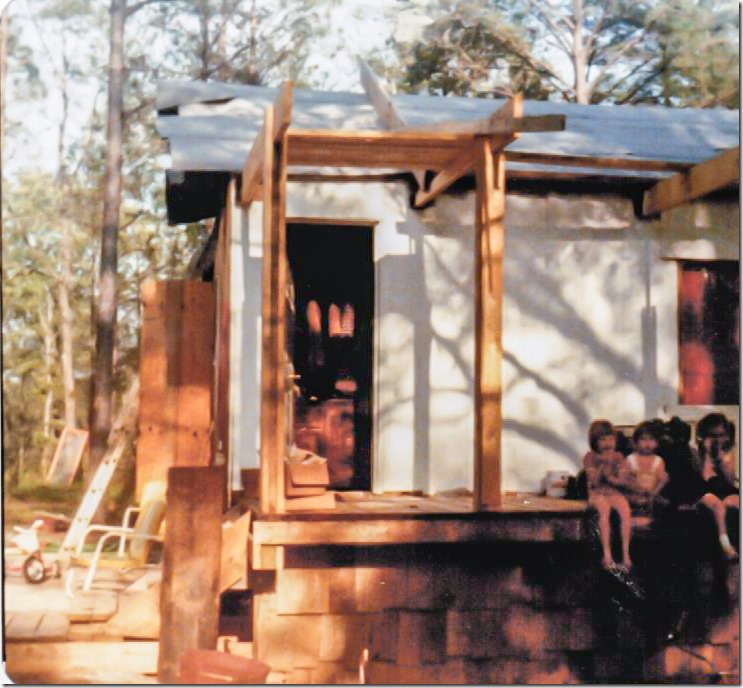 loved reading about the house that built you…what wonderful parents you have! Your post about your childhood home in Alabama brought tears to my eyes, not because of anything you may have lacked by today’s standards, but because of the sweet love for family that showed through every thing your momma and daddy did for y’all. Thank you for sharing your beautiful story. Beth, I thought we were the only people in the world who built the house as it could be afforded. 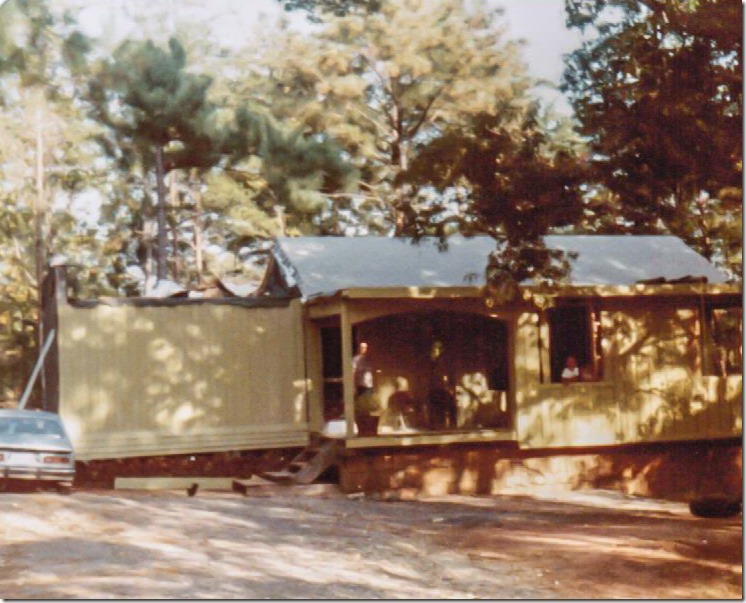 My parents bought a tiny little house from over by the Birmingham Airport when they were doing their expansion in the early 80s, They moved it out to “the farm” and then over the years my Daddy doubled the size of it, and built a porch and deck on it. He even built his own workshop. Times change, and mom finally sold the house after Daddy died, but it was bittersweet. We never had fancy things, but my folks were much like yours, doing the best they could and trying to make something good for their kids. We dug a huge hole next to Daddy’s workshop and tried floating GI Joe boats in it. It’s the little things when you’re kids. I created the Movie in my mind’s eye while reading your story. I remember this family well. We lived down the hill! I spent many days picking those beautiful pink roses. What a lovely blog post. Beth, You must gather your articles and put them in a book. I love reading anything you write. This recount of your young years is captivating. You are an amazing writer and person!! !